There is a spring on the Coconino National Forest that sits at the base of a rock wall hidden behind a small grove of deciduous trees. The wall is maybe 50 feet high by 50 yards long, pocked with grottoes, cavities, and crevices, and horizontally striated with multiple series of ledges, all stained with shades from rust to ochre to black by years of seeping rainwater and winter runoff. I have been there three times, once in August, once in September and, most recently, in early July. When I find an isolated water source, I try to return in different seasons to see who may be coming to the party. This should come as no surprise to those who know my addiction to bird photography. That birds are attracted to water is not a news flash. Neither is the fact that Arizona is in the midst of a prolonged drought. Typically I will go and sit for several hours at a time, on the ground in camouflage, tripod legs lowered and spread. There are two theories at work here--birds are much less wary of unknown objects down low at ground level, and birds can’t see you if you’re not moving. I have proven these theories countless times. Tile layers' knee pads are this photographer’s best friends. My latest visit produced 18 species of birds, but the wall became “ledges of the squirrels” because on this July trip, unlike previous times, there were squirrels everywhere, many individuals of four different flavors: Abert's Squirrels, Red Squirrels, Gray-collared Chipmunks, and Rock Squirrels. The Reds and the Rocks were cautious and shy, approaching the water at ground level from behind a huge boulder, drinking from the muddy perimeter of the bathtub sized spring pond or leaning daintily into it from atop one of several small stones until their muzzles reached the precious liquid. The Abert's and the chipmunks, in twofold contrast, were far from shy and often scampered about beneath my tripod legs. Their approach to the water, however, was at once more circumspect and more acrobatic. Invariably they would run out along one of the ledges, often 50 feet above the water, stopping here and there to sniff for food morsels or gaze out over the world below, scouting for danger, then crawl down the wall headfirst, using all four clawed paws to probe for cracks and toeholds like miniature rock climbers in headfirst rappel. They would arrive at the water, hang by their back paws and drink suspended in space from beneath the last overhanging ledge. How do they drink upside down? I have no clue. I can't do it. Why would they take this route to the water? I have an idea about that. I think the Abert's and the chipmunks, being the largest and smallest respectively, of the four species, were unable to find an access point at water level that was either stable enough or short enough, again respectively, to allow them to drink comfortably. Whatever the reason, it made for great theater, and despite the care and planning their tentative approach from above required, both species when they finished drinking invariably flipped about and ran up the ledges headfirst as easily as if they were running along a horizontal tree branch. The 18 bird species, though certainly exciting for a visitor from the low desert, were the usual suspects for the spring's altitude and habitat--7000 feet in ponderosa pine with an oak understory. Years ago I had a Breeding Bird Survey route through this area. I usually surveyed around Memorial Day and the usual suspects were quite vocal. That, of course, is the essence of these surveys in which the compiler must listen rather than look and keep moving rather than stopping to enjoy, timing the surveys to coincide with the establishment of nesting territories. And, I must admit, the frustration of simply tallying and hurrying on rather than lingering to observe, was a major reason I decided to forego Breeding Bird Surveys, though I know they are valuable tools of "citizen science." Common Raven, party of four--there when I arrived, they might have spent the night on the ledges. I never saw them actually come to the water, and I suspect their old nest might have been somewhere in a grotto along the rock wall though I never did find it. Northern Flicker, party of five--coming for the food as well as the drinks, they spent the whole day in the immediate area showing off their best evolutionary adaptation in its finest usage, bracing themselves vertically on the wall with their stiff tails as they gleaned insects directly from the ledges. Steller's Jay, party of three--also partaking of bugs and water, like the flickers they drank from rocks in the spring pond, but these guys hopped along the ledges for the insects, coming and going about every half hour, and making little or no noise, quite a departure for any species in this family of forest sentinels. Red Crossbill, party of two--water only and extremely circumspect about it too, but where were the offspring? It is widely thought that crossbills breed in the winter when the cone crops are at their peak. Townsend's Solitaire, party of two--a quick drink and then off to the tallest boughs high above the water. Western Tanager, party of five--coming once an hour for a drink, but spending most of their time gleaning insects from foliage surrounding the spring. Dark-eyed Junco (red-backed form), party of four--hopping down to the water seemingly oblivious to everything around them, juncos don't seem to spend much time worrying about danger. Perhaps this is the result of their lifestyle as a ground nesting and ground feeding species. Yellow-rumped Warbler, party of three--flipping down the rock face from above, drinking, then flipping about the spring snapping up tiny flying insects on the wing. Mountain Chickadee, party of three--softly vocal but definitely vocal as you'd suspect, letting everyone in the neighborhood know of their arrival. Red-breasted Nuthatch, party of one--all by himself, perhaps representing the inevitable disasters that may accompany any nesting season and could befall any family of any species. American Robin, party of three--after drinking the male would stand up to his belly in the pond picking what appeared to be dead leaves from the surface and eating them. Having seen various songbirds ingesting both buds and leaves in the past, I did not bother to put my binoculars on this action. Until the next party of nuthatches came. Black-headed Grosbeak, party of three--this family only came once, a bit surprising because they could be heard singing in the area throughout the day. White-breasted Nuthatch, party of four--they came, they drank, they left. But these nuthatches provided the highlight (and the best photo op) of the day. These nuthatches drank like the Abert's Squirrels and the Gray-collared Chipmunks, hanging upside down from the last ledge, hanging headfirst in space for their drinks. This may not be surprising given this species' method of foraging down the boles and trunks of trees as they work their way through the bark supermarket in sharp contrast to the creepers who work their way up, then fly down to the base of the next tree to start up all over again. But wait, there's more. 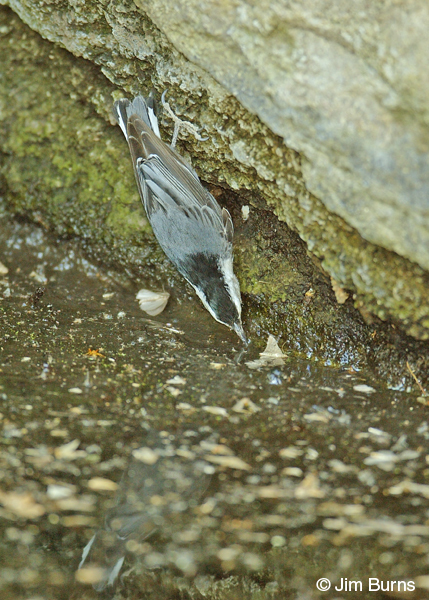 After the family departed one of the adult nuthatches returned almost immediately, worked down the wall again, hung by its toes again, and began to pick amongst the leaves on the water's surface as the robin had done. 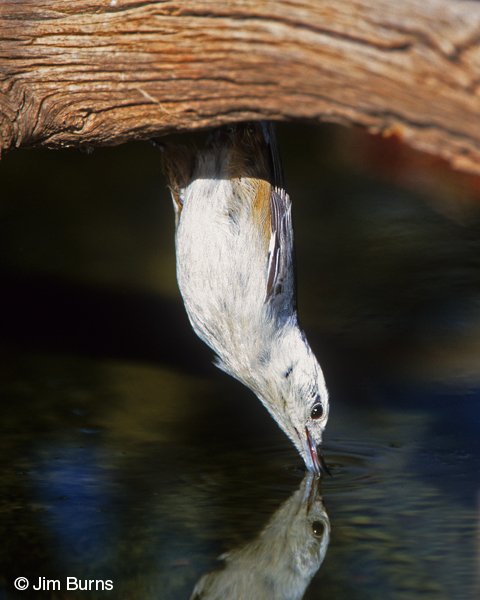 My curiosity now aroused to a new level, I glassed the feeding bird primarily to see if I could identify the type of leaf so delectable its procurement would overcome any fear this tiny bird might have of falling headfirst into the water. Remember the robin, at 10 inches, is nearly twice the size of our largest nuthatch, and the robin had no trouble simply standing in the water to pluck these morsels from the surface. Imagine my surprise when I realized with the aid of the binoculars what I had not been able to discern with naked eye. These were not dead leaves. These were moths. Dead moths to be sure, but moths, not leaves. It recalled to mind a scene from Planet Earth showing a Grizzly Bear scattering small boulders as it dug around on a scree slope high above treeline. The presumption was that it was digging for Pika or ground squirrels, but the correct answer turned out to be moths and the reason was that moths have a very high fat content. Who knew? Besides the bears and the birds of course? This is, ultimately, why biological diversity matters.